Composed by Johann Sebastian Bach (1685-1750). Edited by Richard Sayage. Arranged by Richard Sayage. 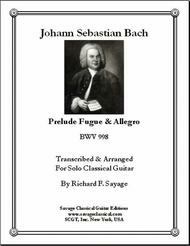 Bach's infamous Prelude Fugue & Allegro BWV 998 arranged for solo classical guitar. Baroque. Book. With standard notation. Published by Savage Classical Guitar Transcriptions (SJ.SCGT-0110). 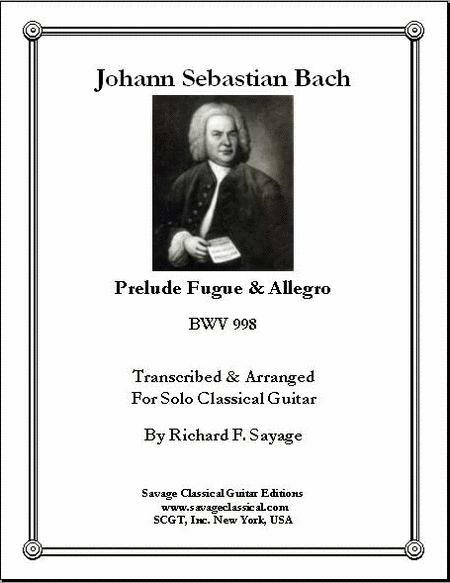 This book for the solo classical guitarist contains the infamous Prelude Fugue & Allegro from Bach's set of Lautenwerke completed in the mid to late 1730's while living in Leipzig. Fully fingered and marked accordingly, the book allows the solo guitarist to explore and express the absolute beauty of Bach and his exploration into music for the lute keyboard.